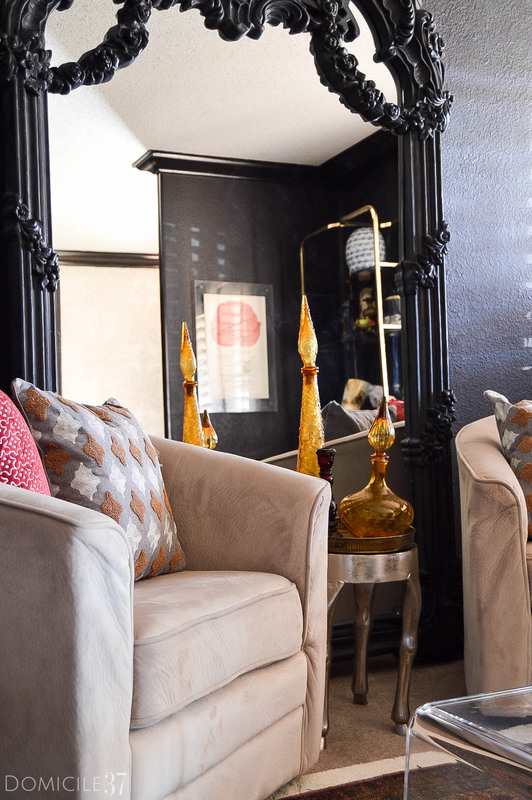 As I was getting ready to write this post for the My Home Style hosted by my lovely friend, Stephanie, from Casa Watkins Living, I realized that my house has split personality. Each room speaks a different language to me. Different feelings and moods are exuded. I have a hard time putting my finger on one specific style and sticking to it. I cannot help it, I like what I like without any explanation behind it….that is all I can say. 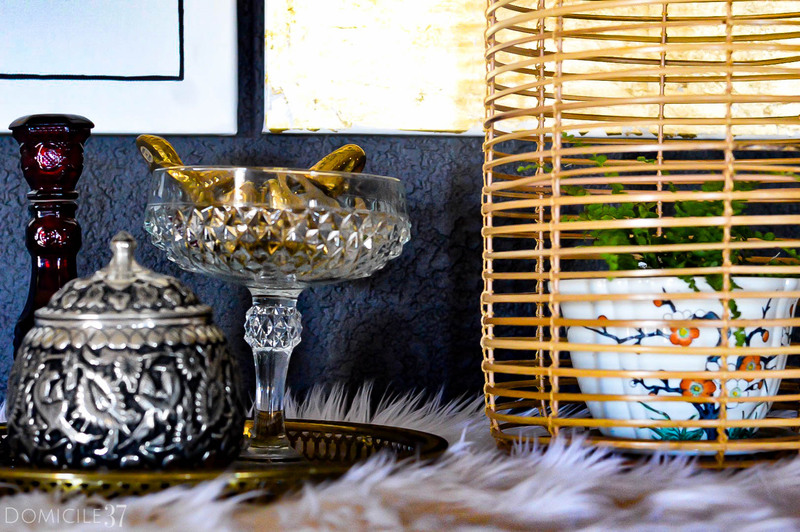 So when I was looking for an area of focus for this post, I decided to focus on the one thing that I love…vintage decor. 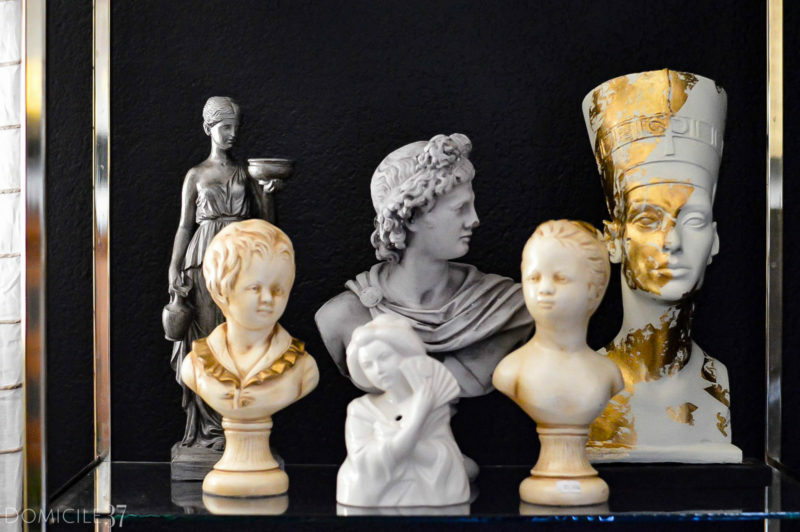 I like to purchase vintage items and mix them with new items and create an eclectic living. I have color splattered all over my home, my favorite colors to use and mix are pastels and muted colors. The only space where vibrant colors are used are in my kids room for obvious reasons. There is one space in my house where I kind of went crazy and used black as the primary color. This room in particular is the space that I am focusing on for this post. This space has more of a moody Moroccan vibe going on compared to the rest of my house. As ideas change in my mind, I am pretty sure this room will someday in the near future get updated, but for now we are going to admire all the cool findings that this room beholds and how I mix and match it. My sitting room opens up to my Foyer. My vision for my foyer was more in the realm of a cigarette lounge. 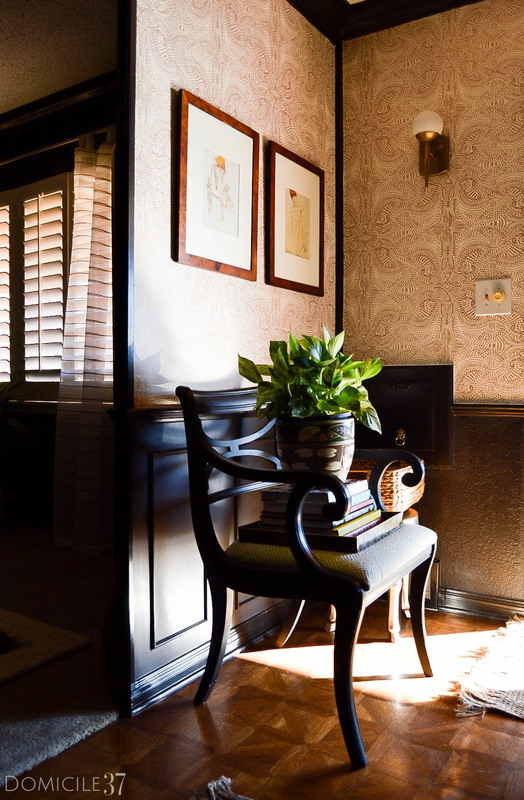 You have a black room with a purple undertone (it reads more like a dark, dark brown) and a busy wallpaper with a copper finish and honey colored floors. Everything in this room fits so well together. The chair was a $4 thrift store find. It is a bit beaten up from our move. I refused to fix the imperfections. I just want to embrace them. I am tired of always fixing things. Imperfections are more like character traits to me. It is scratched up, but oh well. I have some inexpensive Egon Schiele reproduction prints (see here) placed in some store bought burl wood frames. I think the color and the mood of the prints match perfectly with the wood tone of of the burl wood. To be honest, those prints are my favorite thing about this space. It did not cost much to do but it has such a huge impact. If you are not familiar with the backstory of my house, it was built in the 1950’s and has character written all over it. I was told by my realtor that it was a show house and that one of the past owners was an interior designer or something to that nature. This would explain the upholstered walls that used to adorn these walls (see here). To offset the cigarette lounge vibe, I was so kindly given some mid-century sconces from Lamps Plus. Again, so simple, but yet so stunning. I may sound crazy, but my goal is to mix new and old lighting in this home. I have seen some amazing light fixtures for sale at consignment shops and I have installed some modern ones around the house as well. I guess it all depends on my mood. 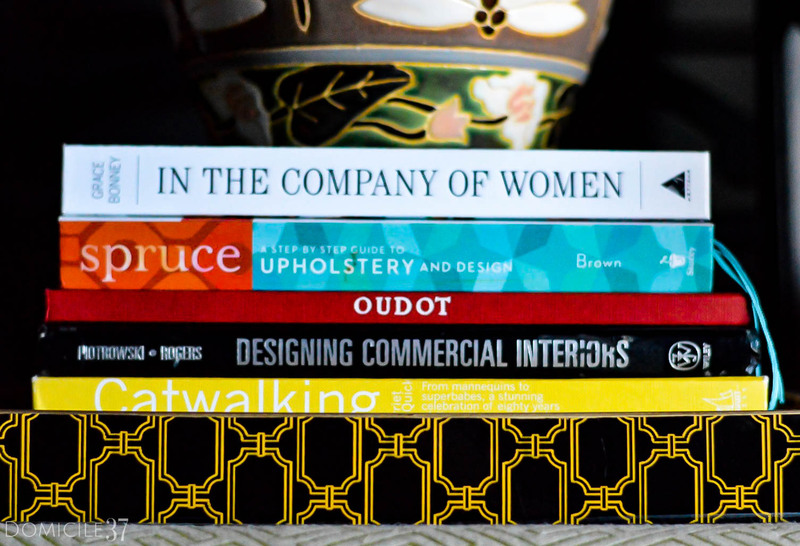 Sitting on the chair in my foyer are a stack of books, some purchased brand new, others used. We do not use our foyer so the chair and books serve more of a decorative purpose than an actual function. 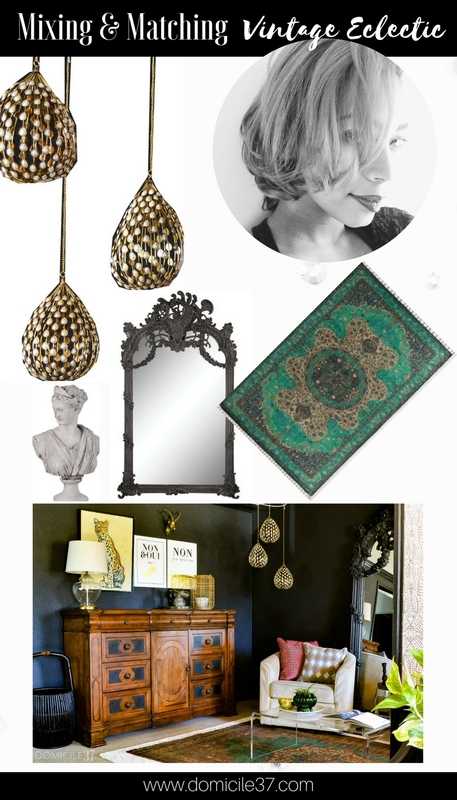 It is no surprise that I have a BLACK, gaudy as Hell-o mirror in my house. No one should be surprised. When it comes to mirror and art, I like it BIG. What attracted me to this mirror was all the ornate detail and how regal it looked. I most certainly underestimated its size and when it arrived, I was shocked by how HUGE it is. I cannot even fully stand it up in my house. Just note, this is one room where the kids cannot play hide and seek! The Moroccan-esque decanters were purchased at the thrift store. When I lived in NC, my husband would stop by the thrift store frequently and buy me stuff…just because he loves me. I have three of these amber colored decanters. I think these two were part of a set, the other one is plan and has a wooden top. I mixed these glassware with a metal target stool that was 70% and part of their Christmas collection. Honestly, that stool can be used year around. I love shopping for things for my home around the holidays, especially Halloween. I consider seasonal decor almost the same as everyday decor. I love little trinkets or junk as some would call it. LOL. I have them splattered around the house and use them for various things. In this room they don’t have much purpose but to look pretty. I am not one to organize things, most of the items in this space are for aesthetics. I like to collect trays, crystals, brass, and anything that has a ton of details. I also have a love obsession with Chinoiserie so I try to use that form of decor in all my spaces if I can. All of the items above were thrifted. I find the greatest pleasure while hunting for a gem, it is better than any store bought item….in my opinion. The rule in my house is if I like it, I will use it. That $4 chair is amazing!! Love the cigar lounge feeling and your moody colors mixed with vintage finds. It’s really perfection. oh i do think you have a cohesive style… i think it is moody because even if it’s a different mood in a different room, your home is very “feeling” if that makes sense… there’s more than beyond the surface and each room moves you to feel something powerful. Moody Moroccan! That is suchhhhhh a good description for this space. It really does emulate the style compared to “authentic moroccan” spaces. I’m always in awe of how beautiful your home is. love this post and your style! This is my favorite room in your house! I love this design and it does definitely scream you. Your mirror completely owns this space. lol. Love it. Vintage is definitely a big unifying element in my house, too. Love this space–that mirror is amazing! Aww, thank you! That mirror definitely makes a HUGE statement in that space. I was so relieved once it was in place because it arrived damaged and we had it laying on its back for a while and it took up so much space!LOL!